Being a bookstore tiger is hard work. There’s much patrolling, and a lot of sitting in laps at story hour, and then there’s sleeping in the window display. But Raj is up to the task. He is fierce and proud—until Snowball comes along. 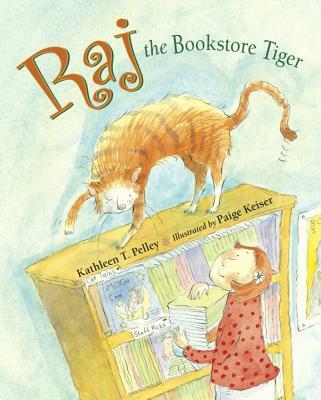 The new cat in the bookstore informs Raj that he’s just a marmalade kitty-cat. Times get tough, then, for the bookstore tiger. But bookstore and Raj owner Felicity, with the help of poet William Blake, knows how to fix things. In turn, with a very special book, Raj is able to fix things with Snowball. Paige Keiser’s quirky, intimate illustrations invite readers to curl up and share a story—with their own tigers or a friend. Kathleen T. Pelley is the author of MAGNUS MAXIMUS, A MARVELOUS MEASURER (Farrar Strauss and Giroux), and THE GIANT KING (Child Welfare League of America). Kathleen lives in Greenwood Village, Colorado.